Front yard with pool and patios at Twin Lakes Inn. We are located in the heart of one of America's most beautiful mountain ranges, the ancient Ozarks. Here, nature lovers, sportsmen and camera buffs will love our awesome scenery in all seasons. Fresh, clean mountain air, lush woodlands and sparkling water make this location a natural for all your vacation needs. We have 13 clean, comfortable and attractive rooms featuring heat and air conditioning, baths with tub and shower, carpeting, ceiling fanlights, vertical or mini blinds, color cable television, and soft water. All our rooms and suites have wireless internet access. All rooms feature microwave ovens, refrigerators, and coffee makers. Each room is serviced daily by our staff. All our rooms have balcony exits overlooking Bull Shoals Lake and our large back lawn. There's a stairway from our balcony leading down to the back yard. Bull Shoals Lake is one of only seven non-polluted lakes left in the United States. Its 1,050 mile wooded shoreline and 44,500 acres of crystal clear water has something for everyone! Boating, water skiing, scuba diving, swimming and, of course, fishing! If you are coming to Bull Shoals for a tournament, or fishing with a group of friends, we have plenty of boat parking. We have outside plug-ins for battery charging. There are 3 launching ramps within ten minutes of Twin Lakes Inn, and we are 5 minutes by water to the tournament area. Come, there's something for everyone! Float the White River in a "jon boat", hike the rugged, breathtaking Ozarks, explore the colorful river caves, shop for mountain crafts or antiques and enjoy some lively country music. How about golf, tennis or horseback riding? While you're here, take some time out to visit some of our local attractions: Bull Shoals State Park and Dam, Blanchard Springs Caverns, Ozark Folk Center, and The Zone, which has go-carts, mini-golf, an arcade, and batting cages. One of the greatest things about Twin Lakes Inn and the Bull Shoals area is something we don't have - mosquitoes! Spend a few days with our friendly and knowledgeable staff, and we know you'll be back real soon! Chances are that you'll meet some of the friendliest, down-to-earth folks around. And our reasonable rates will surprise you. 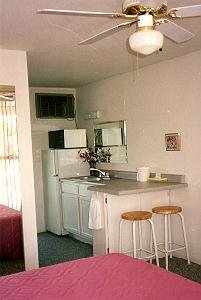 Deluxe rooms have a kitchen counter and can be cooked in. All rooms include 170 channels of color DTV with remotes, refrigerator, microwave, coffee maker A/C and clock radio. All bedding, towels, and daily housekeeping. Our amenities include WIFI, 20X40 pool, multiple patios with grills, boat plug ins, decks off of rooms. Check-in 3:00 p.m. - Check-out 11:00 a.m.
Rate Is For 1- 2 People - $6 For Each Additional Person Over 16 Years Old. Cancellation notice required (Charges will be incurred if no cancellation is made). We must be notified: 72 hours plus 24 hours for each additional room. There is a 3 night minimum stay on 4th of July. We have 3 patios at Twin Lakes Inn. On our large back lawn there's a covered illuminated pavilion and an old fashion porch swing for the adults. Patio areas have barbecue kettles with patio furniture and flower beds. Recreation at Twin Lakes Inn includes a large, inviting swimming pool with a separate kiddy pool for the youngsters. We have comfortable lawn furniture and a shaded poolside patio. For hearty appetites, or those of you who'd like to taste your catch of the day, we have a charcoal grill; and for our energetic guests, we have shuffleboard and horseshoes. If you don't want to cook, there are numerous restaurants in the area. From St. Louis, MO - Take I-44 west to Rolla, MO; take 63 south to Cabool, MO; take 60 west to Mansfield, MO; take 5 south to Midway, AR; take 178 west to Lakeview and Twin Lakes Inn. From Springfield, MO - Take 60 east to Mansfield, MO; take 5 south to Midway, AR; take 178 west to Lakeview and Twin Lakes Inn. From Memphis, TN - Take I-55 north to 63/412 east turnoff; take 63/412 northwest to Hardy, AR; take 62/412 west to Mountain Home, AR; take 5 north to Midway, AR; take 178 west to Lakeview and Twin Lakes Inn. From Little Rock, AR - Take I-40 west to Conway; take 65 north to Marshall; take 27 east to Harriet; take 14 north to Yellville; take 62 east to Flippin; take 178 to Lakeview and Twin Lakes Inn. From Tulsa, OK - Take I-44 east to 33/412; take 33/412 to Siloam Springs AR; take 412 to Alpena, AR; take 65/412 through Harrison to 62/412; take 62/412 east to Flippin, AR; take 178 to Lakeview and Twin Lakes Inn. From Chicago, IL - Take I-55 south to St Louis, follow St. Louis directions. From Dallas/Ft. Worth, TX - Take I-30 to Little Rock; follow Little Rock directions. From Houston, TX - Take 59 north to I-30; I-30 to Little Rock; follow Little Rock directions. Copyright 1996 Twin Lakes Inn. All rights reserved.